Autumn Michaud, 6, a first-grader at East Auburn Community School, works on math problems using an iPad tablet computer in teacher June Simard's class in 2012. AUBURN, Maine — The School Department is ditching laptop computers and going to all iPad tablet computers for kindergartners to high school seniors. This fall, middle school students will get Apple iPads with the cost covered by the state. High school students will also get iPads, as proposed in the school budget, which is far from final. While the state pays for computers for grades seven and eight, local taxpayers pay for computers for high school students. Gov. Paul LePage announced last month that the state will provide Hewlett-Packard laptop computers for grades seven and eight. HP was awarded the Maine Learning Technology’s Initiative contract because it was less expensive, LePage said. School districts could pick a different vendor, but if it cost more than HP, schools would have to pay the difference, LePage said. Mike Muir, Multiple Pathways Leader for Auburn schools, told the School Committee on Wednesday night that the Apple iPad tablet costs less than the Hewlett-Packard, so there will be no additional costs to local taxpayers. It will cost $217 per student to provide iPads, $25 less per student than the Hewlett-Packard laptops, Muir said. That amounts to a $25,000 savings, including providing teachers with new computers. That $25,000 savings will not go back into the school budget, but will stay in a technology account to cover other costs that will come up, Superintendent Katy Grondin said. Reasons the School Department chose the iPad over the HP laptop, Muir said, include that Apple computers have better focus on student learning, while HP is more focused for businesses. Apple also has better technical support and more and better professional development, he said. “Apple, we know, is more focused on learning, not just the device,” Muir said. And, Apple provides a better network, more storage and better battery life, he said. The iPads will be given to students with protective cases. The devices will allow students to use them in creative ways. He’s talked to another high school that uses iPads and he has been encouraged by the results, Muir said. That high school is Foxcroft Academy in Massachusetts. Muir said Auburn educators will soon be visiting Foxcroft Academy to see how students are using iPads. Muir added that Auburn already has a successful iPad deployment, since the district has been giving iPads to kindergarten students for two years. 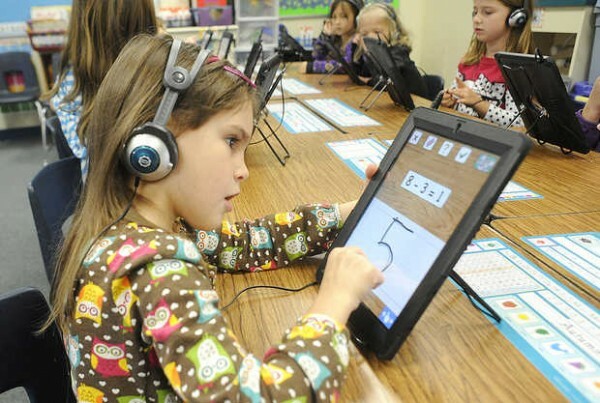 This fall, students in grades kindergarten to two will have iPads, as proposed in the budget. Jake Bazinet, an Edward Little High School student who serves as a student representative on the committee, was excited about high school students getting iPads instead of laptops. The iPads are the future, Bazinet said, adding they are smaller, lighter and easier to carry around. “I’m tired of carrying a 20-pound laptop from 7:45 in the morning to 3:30 in the afternoon — that’s when I leave,” Bazinet said. The iPad will allow students to easily record lessons in class. “I get lost in lessons all the time. For example, math class, I’d have a chance to record the lesson, go over it after with my teacher and understand it, rather than stay after school and go over the entire lesson over again,” he said. That ability, he said, “is steering toward mass customized learning. If you can record your lessons you can go at your own pace, eliminating kids getting stressed out,” he said. Bazinet called the switch to iPads “a huge opportunity” for improved learning. When the decision to use iPads was shared with Auburn teachers, “there was applause,” Grondin said. “There may be nervousness, but faculty agree we’re staying on the right track.